The President's first State of the Union address included several claims related to the recently passed tax legislation, including a few repeat claims. We factchecked two statements made during the speech and from the official White House Twitter account. "We enacted the biggest tax cuts and reforms in American history." The President made his oft-repeated assertion that the Tax Cuts and Jobs Act (TCJA) constitutes the largest tax cut in U.S. history. However, this is not true by any measure. The tax cuts are among the largest in nominal terms, but even then they are still smaller than tax cuts passed at the beginning of 2013. And this is largely due to inflation and because the economy grows over time, leaving more tax revenue to cut. 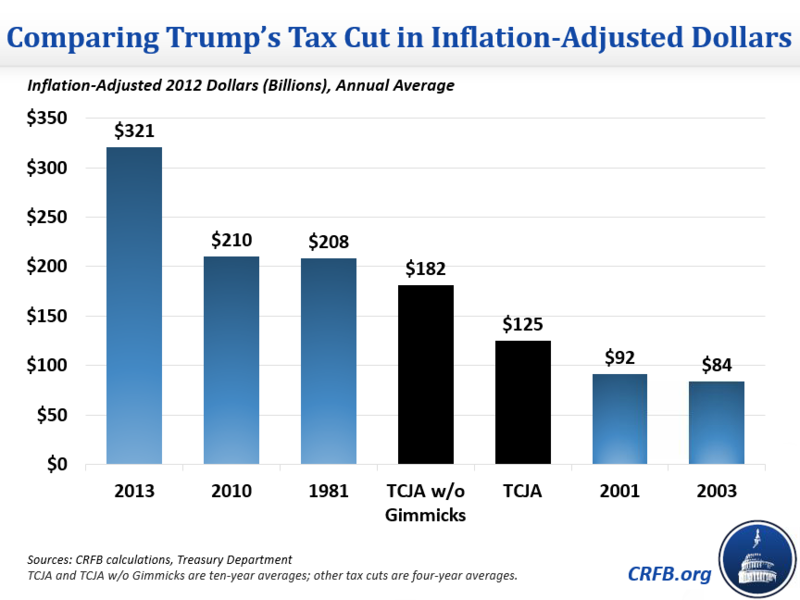 Adjusted for inflation, the TCJA is the fourth largest tax cut in history, behind the tax cuts in 2013, 2010, and 1981. It is the fourth largest whether looking at the official $1.5 trillion cost of the legislation, or our $2.2 trillion estimate excluding the gimmicky use of expirations and delays that artificially reduced the bill's cost. Revenue usually grows faster than inflation, so an inflation-adjusted measure is still biased towards more recent tax cuts. As a share of the economy, the TCJA comes in as the 12th largest tax cut in history at 0.6 percent of GDP. 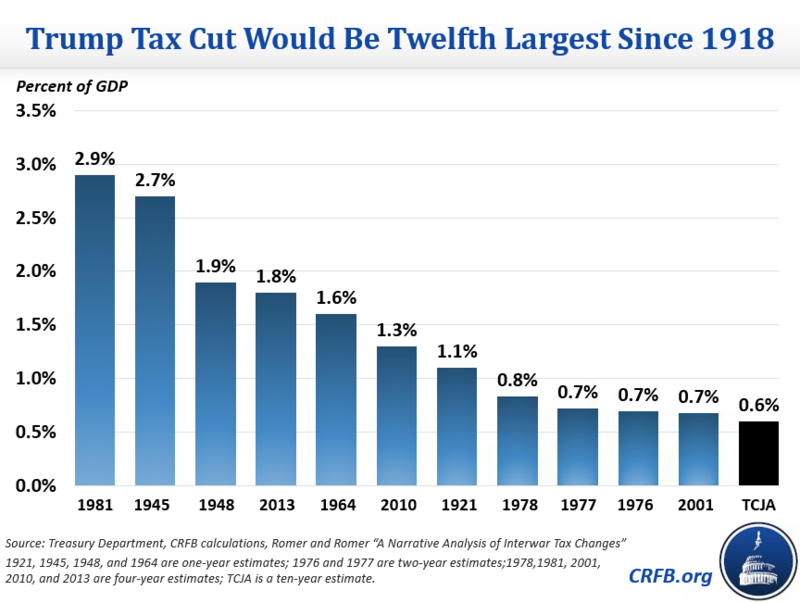 As we have noted previously, in order for the TCJA to exceed the 1981 tax cuts as a share of the economy, it would have needed to cut taxes by $6.8 trillion. This is nearly five times as much as the official cost of the law and over three times as much as the $2.2 trillion "true cost" when gimmicks are removed. 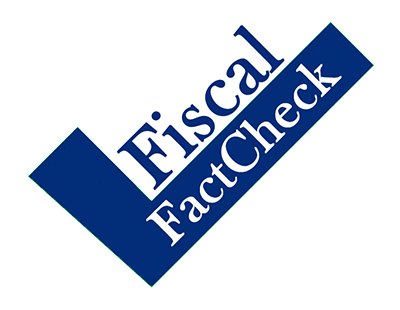 It is a positive thing that the TCJA was not the largest tax cut in history, since adding $6.8 trillion to the debt would worsen our fiscal situation even more than the tax bill already did. Shortly before the State of the Union address, the White House tweeted that the tax bill cut taxes for families by $3.2 trillion. This statistic is technically true, but is missing important context and could easily be misconstrued. We previously published a breakdown of the tax cuts. While the bill's gross individual tax cuts total $3.2 trillion over ten years, it also includes gross non-business tax increases of $2.1 trillion, resulting in a net tax cut for individuals of $1.1 trillion. The table below breaks down the tax cuts and increases by category. Sources: TCJA Conference Report, Joint Committee on Taxation and CRFB calculations. * = Provision is sunset. ^ = Provision is delayed.